Productos Ramo S.A. increased clients by 10 percent. Client survey implementation time decreased from one year to four and a half months. The company is able to better plan sales strategies. Founded in 1950, Productos Ramo S.A. is a popular snack food company based in Cundinamarca, Colombia. Ramo was the first local brand to offer prepared and packaged cakes in Colombia, and its flagship product, Chocoramo, a square of cake coated in chocolate, has been enjoyed by generations of Colombians. This successful company has several factories throughout the country and produces most of its own ingredients, including flour and eggs, in-house. Young men delivering Ramo products to neighborhood stores by freight bicycles are a common sight in larger Colombian cities. Two images above: Maps of the field zones were created by the Productos Ramo sales staff digitizing with GIS. These maps are, in turn, used by staff to create, visualize, and analyze distribution zones. Ramo has enjoyed a period of dynamic growth, making it necessary to increase production. To embrace this growth in the most effective manner, Ramo decided to perform a client survey to reorganize its distribution network. Traditionally, client surveys were performed by printing and cutting city maps into field zones. Field zones enable the company to manage its sales territories. Next, the locations of all the customers were drawn on the map. The process of printing maps and collecting the information gathered from the survey normally took more than a year. Due to the long time frame, the information wasn't always as accurate as Ramo would have liked. Ramo needed to find a way to reduce the time of the client survey and update its sales system information to improve its timeliness and the accuracy of the data it supplied to its sales teams. After a formal selection process, Ramo chose the ArcGIS Server solution implemented by Proc�lculo Prosis S.A., Esri's distributor in Colombia. "It was obvious that this platform would completely meet Ramo's needs," comments Oscar Herrera, information technology manager, Productos Ramo, "and the distributor had the experience and ability to carry out a successful implementation process." Using ArcGIS Server and an Oracle relational database management system, Ramo was able to create an enterprise geodatabase that maintains all information in one common location. This geodatabase gives the company the ability to input data once and use it throughout the organization. Information such as customer locations tied to sales volumes, street-level datasets, and business-related layers, including sales and delivery territories, is now available for use throughout the organization. Maps of the field zones were created by the sales staff digitizing with tools in ArcGIS Desktop. These maps are, in turn, used by staff to create, visualize, and analyze distribution zones. 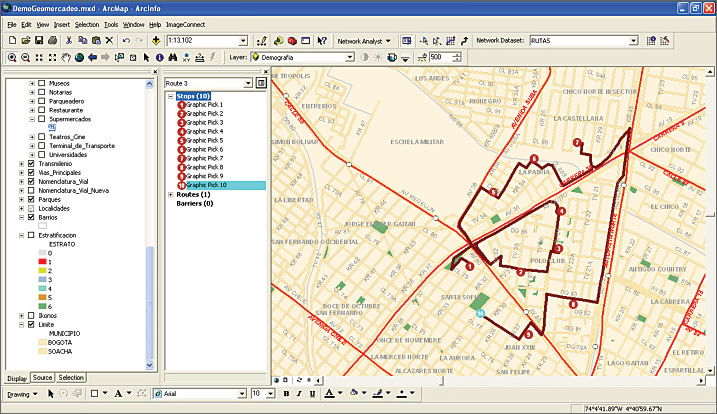 Ramo geocoded client locations based on local street maps throughout Colombia in the geodatabase with ArcGIS Desktop. 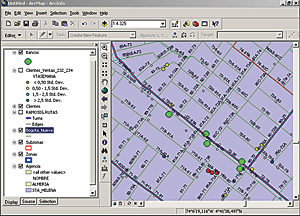 In areas where street maps were not available, a GPS was used to create a point location in the geodatabase. New distribution zones were organized by rules garnered by the company's sales criteria. Optimum delivery routes were generated for the company's 700 freight bicycles and trucks using the ArcGIS Network Analyst extension, which gives the company the ability to create manual routes when necessary in more rural regions where road maps are not available. The software has been set up to take into account that person-powered freight bikes cannot use streets that are too steep. Published maps are distributed and incorporated into Ramo's in-house business reporting tools. This ensures that marketing analysis, coverages of the distribution zones, and locations of customers are available throughout the organization. 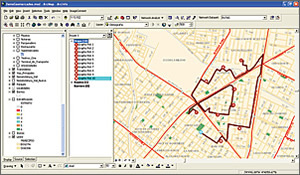 The GIS application is used directly by four GIS analysts who geocode new customers and calculate territories and delivery routes. The geographic reports are then queried by the sales and marketing staff, as well as the company's management team and stakeholders. The project was completed in only five months. Company "Has Its Cake and Eats It, Too"
Implementing GIS has benefited both Ramo and its customers. The client survey Ramo performs takes much less time to perform. Instead of one year needed to survey all customers, Ramo has decreased this to only four and a half months. Having more reliable and timely information from this survey means Ramo can plan better sales strategies. Using GIS to create new field zones and route distribution of products instead of doing this task by hand ultimately provides better customer service. Having this information readily available helps Ramo identify the needs of its clients and analyze product sales. Field zones have been reorganized based on knowing where clients are located and how they responded to the survey. "The key to this project's success was selecting a group of top sales representatives to participate," says Herrera, who both supported the project from the beginning and guaranteed the company would have enough resources to execute a successful project implementation. Having Proc�lculo Prosis S.A. involved from the beginning and throughout the technology implementation was also very important to the success of the project. Ramo has been able to meet its objective of increasing the number of clients in each sales and distribution zone by 10 percent. In Bogot� alone, for example, Ramo has found 8,000 new customers. For more information, contact Marta Madrid, Proc�lculo Prosis (e-mail: mmadrid@prosis.com).